Then he saw her face…now she’s a Belieber? 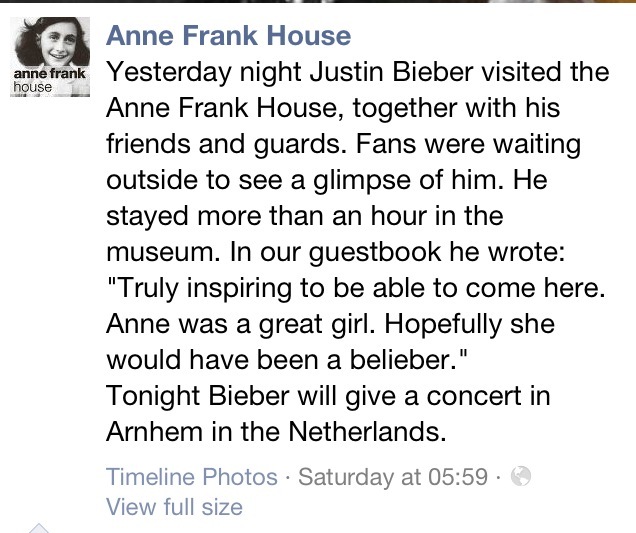 Justin Bieber went to the Anne Frank House last week and caused something of a controversy when his comment in the visitors’ book was released via a Tweet from the museum itself. For accuracy’s sake, here’s the text. The business end of Barnett’s article, though, is in the final four paragraphs, where she outlines what I suspect are a representative set of attitudes under the outrage. To avoid any possibility of misrepresenting Barnett through clumsy paraphrasing, they are reproduced verbatim below. Of course we don’t know if she would have been a ‘belieber’. The little girl inside of me hopes the wonderfully vibrant Anne Frank wouldn’t have stooped so low to be a cult follower of anything. She was a leader in my mind, not a follower. But I won’t be as crass as Bieber to try and even imagine her tastes or anything beyond those words she shared in her diary, her darling ‘Kitty’. 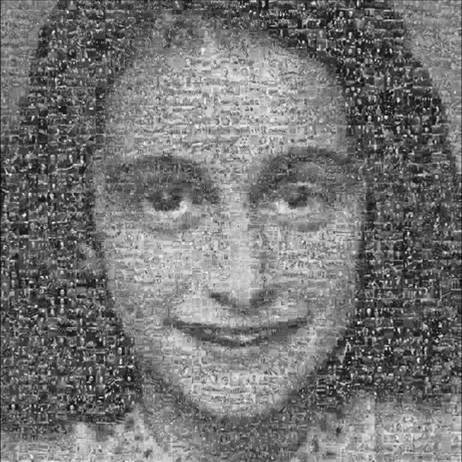 What she wanted to let ‘Kitty’ know, (and then what Otto Frank deemed acceptable to share with the wider world when he published his daughter’s remarkable diary) is all we can and will ever know about Anne Frank. As you leave the Anne Frank Museum and write in the guestbook, most people I know almost don’t have any words. They often just share their sorrow, perhaps their own Holocaust story if they have one and express their praise and gratitude to the people who have kept Anne’s story alive. They certainly don’t write anything which is self-referential, nor attempt to guess what Anne would have been like had she been born to different generation. Justin Bieber needs to take note. The truth, though, is that we don’t know very much about what Anne thought about many things. As Barnett acknowledges, Anne’s diary was edited after the war by her father, who suppressed references to Anne’s sexuality and to the tensions in her relationship with her mother. Whatever the motivations for these choices, there can be little doubt that the version of the diary sold in the UK for much of the last sixty years has been The Diary of a Young Girl rather than (as it perhaps should be) The Diary of a Young Woman. You’ve known for a long time that my greatest wish is to be a journalist, and later on, a famous writer. We’ll have to wait and see if these grand illusions (or delusions!) will ever come true, but till now I’ve had no lack of topics. In any case, after the war I’d like to publish a book called The Secret Annexe. It remains to be seen whether I’ll succeed, but my diary can serve as the basis. From then on, not only was Anne writing with at least half an eye to posterity (there is, for example, a broader selection of themes than previously), she also edited and rewrote earlier sections. What we have of the diary for December 1942 to December 1943 is all from this period of rewriting. The authoritative Critical Edition of the Diary published by the Netherlands Institute for War Documentation in the 1980s puts all the alternative versions of all the entries alongside each other: a much less digestible and straightforward document than the paperback still (rightly) available from most bookshops. But this complexity means that everyone is creating an Anne of their own from the fragments left behind: Barnett is fooling herself if she thinks she isn’t ‘second-guessing’ Anne to some extent. Indeed, the final entry of Anne’s diary explains at length the extent to which she ‘second-guessed’ herself. As I’ve told you, what I say is not what I feel, which is why I have a reputation for being a boy-chaser, a flirt, a smart aleck and a reader of romances. The happy-go-lucky Anne laughs, gives a flippant reply, shrugs her shoulders and pretends she couldn’t care less. The quiet Anne reacts in just the opposite way. If I’m being completely honest, I’ll have to admit that it does matter to me, that I’m trying very hard to change myself, but that I’m always up against a more powerful enemy. Perhaps the most memorable quote from Anne’s diary is her comment on 5 April, 1944 (in reference to her literary ambitions, in the immediate wake of the Bolkestein broadcast) that ‘I want to be useful or bring enjoyment to all people, even those I’ve never met. I want to go on living even after my death!’ She certainly has: almost seventy years later, she is still famous and her diary is still the first introduction for many to the history of the Holocaust, though (as Barnett points out inadvertently) the Holocaust to a large extent happens ‘offstage’. But this kind of fame comes at a price. Anne Michaels wrote in The Winter Vault that ‘we cling to the paintings from Theresienstadt, to a Dutch girl’s diary, because we need them to speak for every war child’s loss.’ But in making them speak for anything but their own fate and being, we make them into puppets for our own ends. Many of these ends are laudable – the work done by the Anne Frank House and the Anne Frank Trust, for example, in educating about the Holocaust, racism and (in)tolerance. Conversely, it might be argued that to derive an educational programme from the diary of a 13-15 year-old without her consent is to indulge in an editing of the past that is necessarily self-referential. We are all guilty of the same offence as Nathan Zuckerman in Philip Roth’s The Ghost Writer as he tries to persuade himself that a mysterious graduate student is actually Anne, survived and gone into hiding. ‘Alas,’ he writes, ‘I could not lift her out of her sacred book and make her a character in this life.’ Neither can we: we are all left with the blank knowledge that ‘Anne’s Diary Ends Here’. I wonder whether Barnett would object to a photograph of Anne appearing on a Holocaust textbook? I suspect not, and yet for me the question this raises is to what extent the remarkable, inconsistent and talented young woman that Anne was is obscured by her placement within a view of the past that she could not consent to. Anne died in 1945, just days before the liberation of Belsen. We do not know the extent of her knowledge that she was one of the last victims of a campaign to murder the Jews of Europe. It had certainly not yet solidified into the historical edifice of ‘The Holocaust’. We also – and this is the tragedy when someone so talented dies so young – have no way of knowing how it might have changed her outlook. We all second-guess Anne, all the time. We have to, because we too must go on living after her death. Quotations from Anne’s Diary are taken from Anne Frank: The Diary of a Young Girl, The Definitive Edition edited by Otto H. Frank and Mirjam Pressler, translated by Susan Massoty, published by Penguin in 2001.